Read the World of Cruising magazine interview with Richard Harry, Hotel General Manager of Ruby Princess. What are the requirements for a career in hotel management on a cruise ship? The most common general requirements to apply would be a Hotel Management degree, with a certain level of prior experience in luxury resorts or hotels. Personally, I believe you must possess an ability to think on your feet and love working with people. To work away from home with such diverse cultures and nationalities while maintaining consistent levels of excellent service demands a certain type of person and we are always on the look-out for such talent to nurture and mentor. What is your background, and where did you train? I first worked in a country house hotel called the Gliffaes Hotel while at high school in Wales and loved it. I went on to complete a Hotel Management degree at Colchester University. Where were your first jobs and how did you get into cruising? Have you always been with Princess? How did you join them and how did you work your way up to your present position? I only applied to Princess Cruises and have only worked for them in my 25 years at sea. I joined them in 1989 when the company had just five ships, and it was a wonderful time to join. So much was happening and the industry was heading for some exciting times and massive growth. I joined as a receptionist, which back then was not an officer position, but realised very quickly that this was for me. I sought challenges and personal growth, and was lucky enough to do new-build launches for five of the new ships starting with Grand Princess in 1998. What are the responsibilities of a cruise ship hotel general manager?How many crew are you responsible for and what jobs do they do? I run all aspects of the hotel, including food & beverage, accommodation, all retail and entertainment and have oversight of the medical team. My team is approximately 900. We also facilitate the many logistical challenges of entering and leaving ports worldwide, mass crew and passenger movements and ensuring the highest levels of customer service and training are maintained. We all share a high level of duty to safety and hygiene that is second to none in the hospitality industry. Is there any history of seafarers in your family, or are you the first? What is the highlight of your career so far? And what are your ambitions for the future? A highlight is definitely the launch of the Sapphire Princess in 2004. As part of the new-build team we lived and worked in Nagasaki, Japan for several months. I was then the shipboard person overseeing and organising the inaugural celebrations, which meant dealing with press, dignitaries and event planning whilst not impacting the ship operation. It was high profile and challenging, and carried out in such a fantastic part of the world. Can you give a brief outline of a typical day at sea (or in port)? Lots of meetings, planning, spot-checks, hiring, firing, disciplinary, etc? The thing that myself, and I’m sure my colleagues, love so much is that there is no such thing as a typical day for us. Our job is varied, and with a moving hotel, there are a whole lot more challenges that come our way that static hotels or resorts just do not have to contend with. One day we may have to skip a port where we were to load vital food stores. We would then have to move quickly to revise our menus and plan future ordering to make sure passengers are not impacted and in fact have no idea this has happened. The next day we may have an on board wedding to plan for or be preparing for the next turnaround. Sailing at maximum capacity is the norm for cruise ships and spare staterooms are rare unlike hotels. Problems have to be solved but also positively managed on a personal level with speed ensuring excellent customer service to our guests. What’s the best thing about working at sea? Certainly the variety, the vast array of people you meet and the incredible sights and experiences you come across. Being away from family especially the time you are out of contact. That is very tough. I have been incredibly lucky. I was on one of the last large cruise ships to be permitted to go to Antarctica which was amazing. South America itself is a fantastic destination in itself with so many unspoiled wilderness areas and wildlife to see. I also did a circumnavigation of Australia which I loved. The beaches and tours there are amazing! 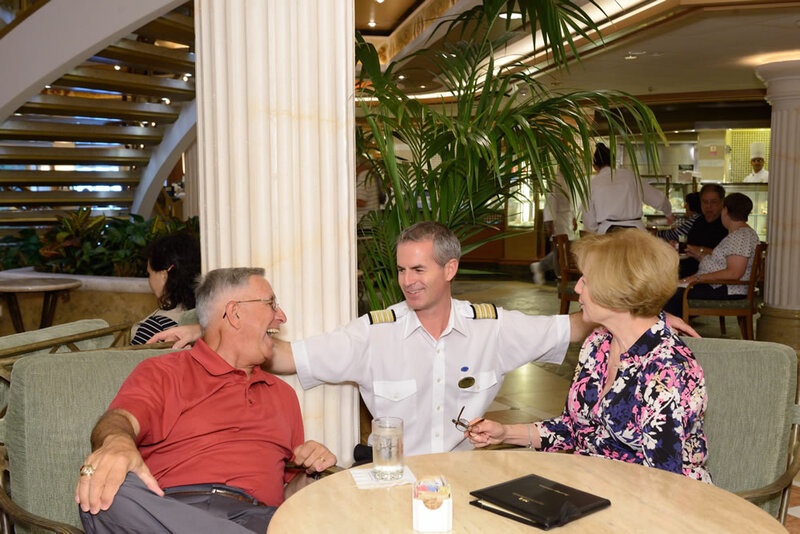 Did you meet your wife on a cruise ship? I met my wife on the inaugural sailing of Golden Princess in 2001, although I didn’t pluck up courage to approach her until my last few weeks on board. Luckily I did! Her name is Wendy and she was a dancer in the production shows at the time. It’s a special thing to see you wife perform on stage in such great shows. We now have a daughter Isla, who is 6, and a son Alex, who is 4. Is there one thing that would make your job easier? And one thing that would make life better for passengers? I have no wish to make my job easier; it would take the challenge out of it which is one of the unique attractions of this position. For our guests, I think as long as we continue to look at new ways to entertain and embrace trends and changes in hospitality then we will be able to continue to give them the very best. CRUISE DEBATE: What is the best cruise horror movie to watch this Halloween?